Lighting is becoming an increasingly popular way to add a little spice to people’s homes. One way you can do this is by using Besa Lighting. It is about being creative and original, and Besa Lighting utilizes glass designs with all types of colors, patterns and styles. 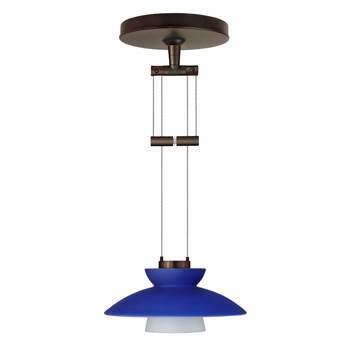 Crescent Harbor Modern can give you the latest styles in Besa, and we can provide you with mini Besa pendants, regardless of your budget or style. Besa lights are a contemporary style, and we offer a selection of glass and finish options. Our Besa line of pendants is able to complement any style of home, and it doesn’t matter what color scheme your home is. You will even be able to coordinate with other fixtures. We have a variety of styles to choose from, including sconces, outdoor lights, and lighting pendants. For example, our “1XA-1176 Besa Kona 12 V Pendant” with a flat canopy has a cone-shape bottom that will make your kitchen brighter. It will be suitable for a modern home in the living room area as well. It also combines style with practicality. If you like that style, a similar style, which is the “1 WW -1176 Besa Kona Single Swing Arm Wall Sconce,” is a choice for a nice wall sconce. It will work well to light up a long hallway and looks very similar to the Besa Kona lights. Additionally, it can act as ambient lighting, or task lighting, too. If you’re looking for something with a little more color, our “Besa Trilo Adjustable Pendant with Flat Canopy” would be a good choice. It hangs from a black base, and it has a hanging blue glass ornament. This pendant will give your room some life with its vibrant color. On the other hand, if you are looking for something elegant, our “Besa Lucia One Light Pendant with Dome Canopy” will add that finishing touch to any living room. It is suitable for sloped ceilings, and it is easy to install. It has a bulb-like lamp, which will brighten up any special family dinner or occasion. Modern pendants work well in the busiest areas in your home, such as a kitchen island or if your living area has a high ceiling. They have the potential to change the mood of the room, and will personalize your home as well. Why should you choose pendants? According to an article in WiseGeek, pendant lights can help bring style to a boring room, and it won’t take up any much needed tabletop space. It can also work well in high ceilings, and it will give it some life, because it is normally suspended by a cord. The light will become more accessible, and that light will reach closer to where your family and friends are. Look no further for mini pendant lights to make your house more modern. Our prices are affordable, so please take a look at our website today and pick out a new pendant style to match your taste.